I love clothes. I also love shopping. As far as I can tell, these dual interests come with the territory of being a woman. Oddly enough, I don’t always love shopping for clothes. I become overwhelmed by my options, or I am unsure about what items will be flattering or fit my “style.” And seriously, does anyone look good in those fitting room mirrors, because I certainly don’t?! I must not be the only woman with a dislike for clothes shopping, because – as I learned recently – there are actually personal styling services out there that will do your shopping for you. 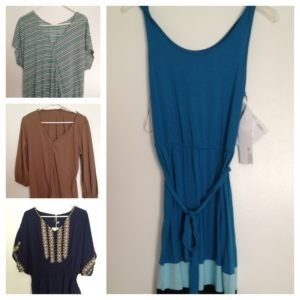 Stitch Fix is one such service, and after hearing several bloggers and podcasters talk about their successes with Stitch Fix, I decided to give it a try. 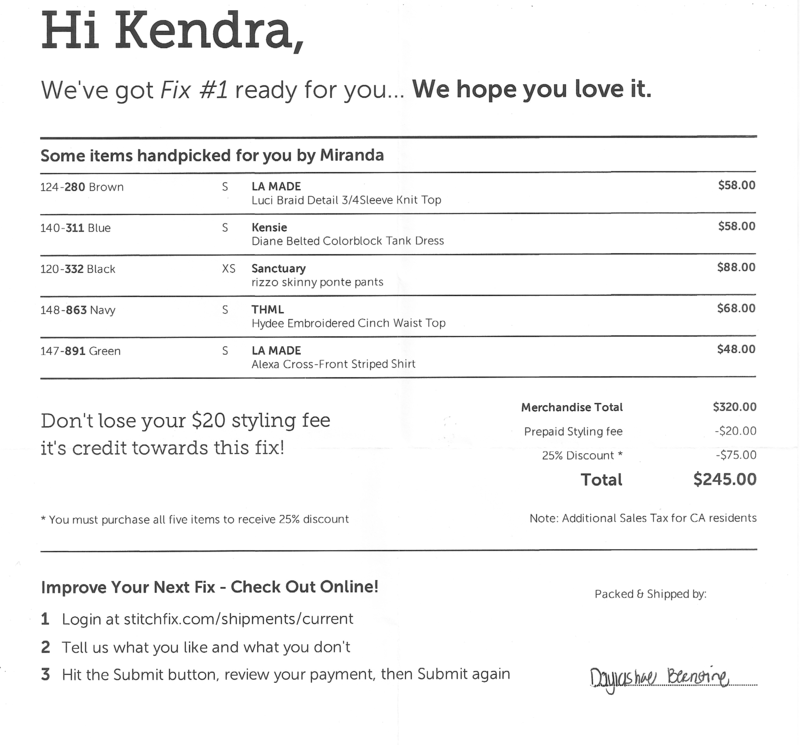 Using Stitch Fix’s service was pretty straightforward. My first step was to create a style profile, in which I completed a detailed survey about my sizing, fit and style preferences, the types of items I was looking for, and how much money I wished to pay. I was impressed by the thoroughness of this survey, which seemed effectively designed to determine the types of clothes I like and what would work best for my body and my lifestyle. There was even a section where I could include any additional notes for my stylist, as well as an option to link to my Pinterest style boards. After completing my profile, I paid the $20 styling fee, which was nonrefundable but would be applied to anything I kept from my shipment. I then scheduled a shipment date for my “Fix,” when 5 hand-picked items would be sent to me. Upon receiving my Fix, I would be able to try on the items to determine which pieces I would purchase and which I would return. A couple of weeks later, I received my Fix in the mail! I excitedly opened my package to see what types of items my stylist had chosen for me. Inside were three tops and a dress (all pictured above), as well as a pair of black skinny ponte pants. I was thrilled with the selections: though none of the pieces were anything I would have picked out for myself, I liked the style, and with the exception of the pants, they all fit well and were quite flattering. I loved that each item had an affixed tag (example pictured above) containing a full description of the piece and showing different styling options for the item. A 25% discount would have been given if I had chosen to keep all 5 items, bringing the total to $245. My disappointment came when I looked over the invoice indicating the price of each item. The tops and dress ranged in price from $48 to $68, and the pants were $88. I realize that many people spend much more than this on their clothes, but when completing my style profile, I had selected “the cheaper the better” option when asked how much I normally pay for my clothing (other categories were $50-$100, $100-$150, etc., up to $200+). Given the quality of these items, they definitely seemed overpriced, and I really could not justify spending these amounts on clothes I could find much cheaper elsewhere. However, not wanting to lose my $20 styling fee, I did decide to keep the least expensive item (the striped top), telling myself that $28 (my balance after applying the credit from my styling fee) was a fair price to pay for a nice top. 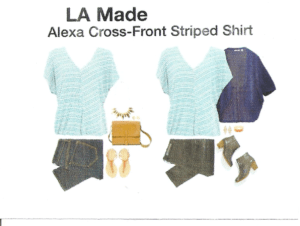 My selection made, I (sadly) placed the items I would be returning into the prepaid mailing bag and shipped them back to Stitch Fix. Finally, I logged in to my Stitch Fix account to pay for the item I had kept, and my Fix was complete. 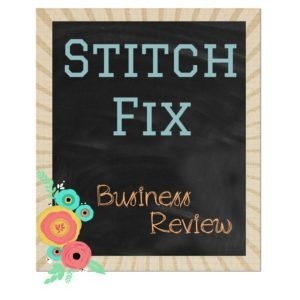 Overall, I really enjoyed my Stitch Fix experience. The process was simple and it was fun to see the types of clothes a professional stylist would pick out for me. Viewing the items in my Fix opened my eyes to some new styles that I would not have tried on my own. Unfortunately, I do not think that I will be scheduling another Fix any time soon. 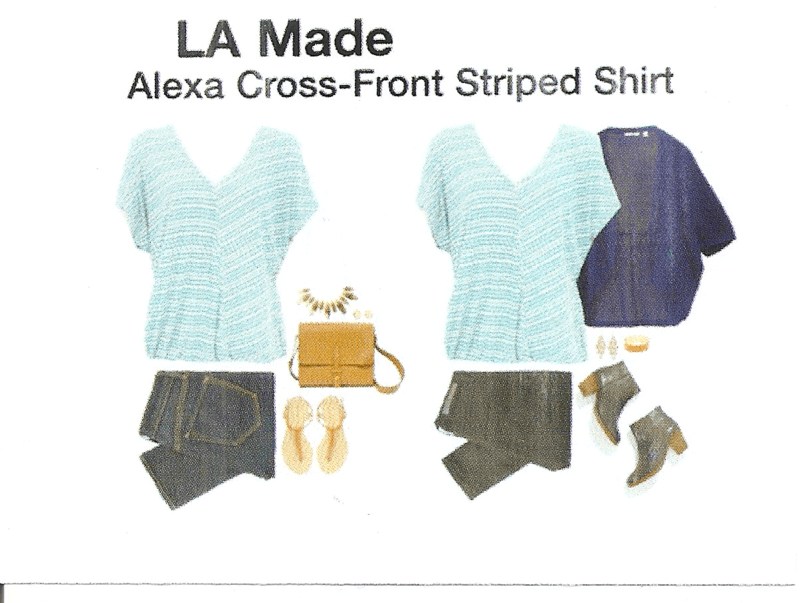 As someone with a limited clothing budget, I don’t really feel like I am Stitch Fix’s target demographic. 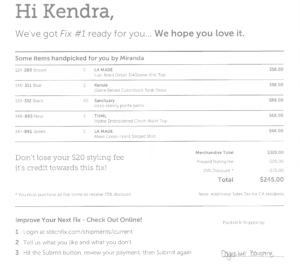 However, if you are willing to spend a bit more money and would like some help updating your wardrobe, Stitch Fix might be the right fit for you!